A New Zealand expat and her son use their prefabricated lakeside New Jersey retreat as an outdoorsy counterpoint to city life. Curious on what was popular last week? Click here! Modern Fan Company’s Cirrus Hugger models help the breeze along. She had low-level Sub-Zero and Wolf appliances as well as pop-up vents installed in the kitchen so there’s nothing at eye level. Container Store: Since the first floor is mostly transparent to the outdoors, built-in storage for hiding detritus is crucial. In Blake’s playroom, just off the entryway, floor-to-ceiling drawers with simple Sugatsune pulls are labeled with every kind of bric-a-brac, from Legos and Playmobil to action figures and stuffed animals. Debbi Gibbs first encountered Lake Iosco more than a decade ago, when she started visiting the home of family friend Florent Morellet, proprietor of the legendary, now-departed diner Florent in New York City. The lake is part of a private neighborhood in New Jersey with an unconventional cooperative arrangement: Each person who purchases property actually buys into a group of shareholders and is granted a 100-year lease on the land. Gibbs loved the seeming wilderness of the area, especially considering its relative proximity to her New York apartment. She bought a ramshackle cabin with plans to tear it down and start fresh, then bided her time until she found just the right architects. 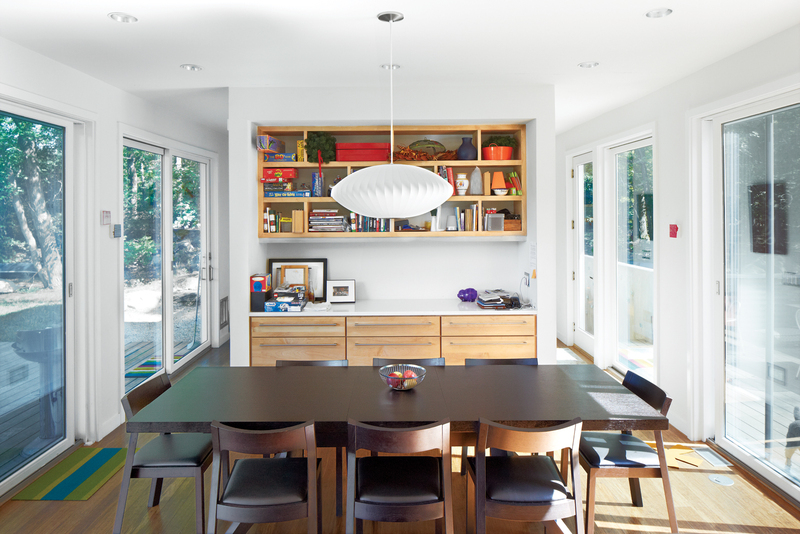 Enter Joseph Tanney and Robert Luntz of Resolution: 4 Architecture, who granted her wish for an open prefabricated structure with custom design touches. Gibbs: My friend Florent has a house you can see across the lake from ours. I used to come out and stay with him on the weekends, at least once a month. Then, when I got pregnant with Blake [now ten], I thought that the invitations might dry up, so I started looking around in this area for other houses. It’s so easy compared to four hours in traffic to get to the Hamptons. I can always get here door-to-door in about an hour, which means I can pop out for one night or just the day. Image courtesy of photograph by Mark Mahaney,all rights reserved. The great thing is that the Lake Iosco Company owns 400 acres—woods, properties with houses, and the lake—that back onto the protected Wanaque Reservoir. So there’s all this wildlife right in the middle of the suburbs—black bears, red foxes, beavers, mink. And yet, ten minutes west is a suburban New Jersey strip mall, which is extraordinary. When I bought this property there was a little one-room shack on it. The tops of the windows were below my eye level—I could look down and see the ground but I couldn’t look out—so my biggest wish for a new house was to be able to see the surroundings. We were initially going to live in that shack for just one year, in order to get a sense of the seasons and how we’d use it. Then we ended up living in it for five years! By which time I hated it. I have an architecture degree, and I’d been interested in Case Study houses since I was in school. I’d been looking vaguely at prefab, but most of what I saw was international, not American. After I bought this property I saw the Dwell Home competition [in Dwell’s December 2004 issue]. No other house had the flexibility of Resolution: 4’s modular system. I tracked them down in the city and we started talking. I had a very clear idea of what I wanted design-wise, but Joe and Robert have such great expertise in terms of both the restrictions and possibilities of modular units. 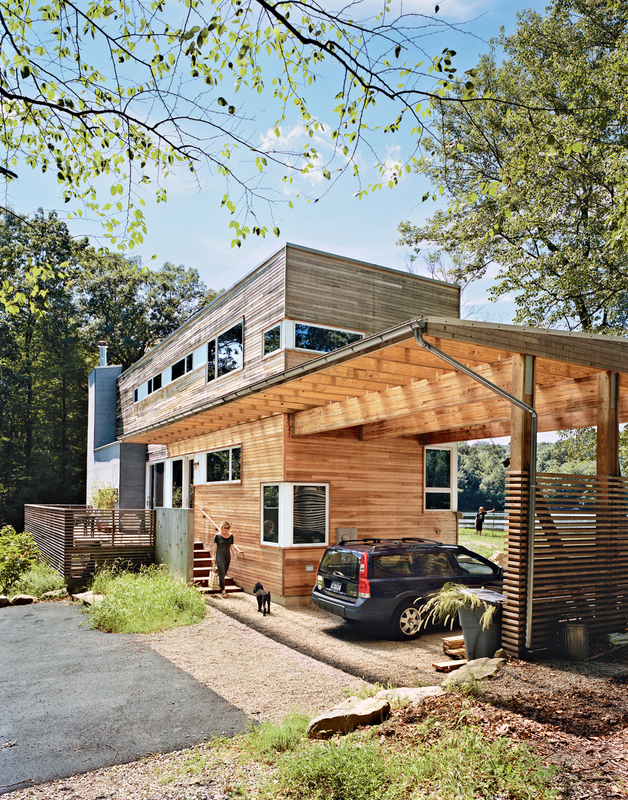 I don’t think your average architect could waltz in and design a prefab house like they do. The old house was like a cave, and I wanted this house to be the opposite: a pavilion where you didn’t feel enclosed at all. We used every inch of glass allowable under code! The reason we came here is the outdoors, and the house is designed so that the outside is an extension of the inside. It flows, and it’s very permeable, unless you want the protection of closed doors. One of the striking things is that there are no walls in the main floor living space. And I wanted a kitchen at the middle of the house, with low-level appliances and drawers down below, in order to socialize. Resolution: 4 had a list of preferred materials and components that they could source easily. I didn’t feel restricted because a lot of them were ones I had chosen for my apartment remodel the year before, for which I’d done endless research. I went off their list some—the KWC kitchen faucet and my glass tiles by Daltile in the bathroom—but the architects suggested easy, good-quality things that the factory could cope with. There are neighbors on the lake who love the house, and there are others who very politely say it’s not their style. Interestingly, my taxes went down because in this area, a house like mine is in the lowest tax bracket—maybe it’s considered the least desirable.